Eeyore is so sweet. Don't you just love him. Yours looks perfect! Nice job. What a great job on eyeore!!! Thanks for sharing. This is so adorable!!! Did you use your imagine to get the colors? Sweet! He is so huggable! Great card!! This is so darn cute! I love it!! 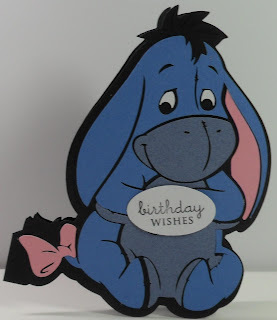 I love Eeyore and this is just adorable! TFS! I saw this on MPS - absolutely adorable - it caught my eye right away! Super Cute. thanks for sharing!! I love your card. It is definitely one of my favorites. Very nicely done! Awww... what a cute Birthday Card! Love it! Gloria, this is SO CUTE! I love eeore!!! Thank you for stopping by my blog and leaving a very nice comment. I agree this card is so super adorable! Great job.